“A Boy’s Journey” . The album joins Peter with some fine young Canadian musicians playing all Hum penned compositions. Nathan Cepelinski. The two demonstrate that Canada has no shortage of vibrant new voices on horn. 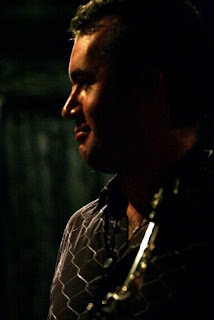 Ceplinski is particularly melodic and fluent. Hum, for his part, is a reluctant soloist playing back seat on this and most of the other songs on the cd. He seems content to feature his carefully crafted compositions rather than his own piano voice. Alec Walkington, no pun intended, and captures the feel of the classic Blue Note front lines, repeating the main theme in tandem. Hum’s piano solo has a Nelson Riddle kind of tinkle to it, with the song reminding me of Riddle's work on Route 66. Omae’s tenor is selective and smooth. The ruminative “La tendresse, s.v.p. ” is a short ballad that features Hum’s more pensive side. “Big Lou” is an interesting modern piece with an ostinato bass line that finds Cepelinski on soprano (or is that melodica) and Hum on electric piano. The piece shows promise, but it comes off a little awkward in execution to my ears. Cepelinksi’s foray on soprano starts off light and airy, but then loses me again halfway through his solo. Walkington and drummer Ted Warren carry this one. 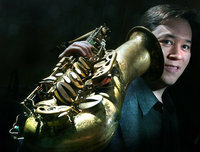 On “Midway”, Hum’s approach is more classical, playing repeating lines that create the format to allow the two saxophonists space to engage in conversation, as Warren crashes his cymbals behind. “Sojourner’s Truth” offers a funky electric piano sound that is augmented by the front line horns. Omae’s muscular tenor finds its soul on this one. Cepelinski chooses a more deliberately probing solo on alto, with some nice moments as he explores the psyche of the rhythm. “C.G.” is another straight ahead bounce that intertwines soprano and tenor behind Hum’s comping piano lines. Cepelinski’s soprano solo is lithe and liquid. 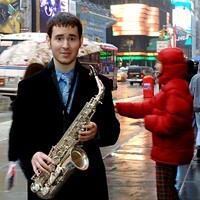 Hum, inspired by his saxman’s solo, is at his most free swinging here. Walkington easily switches from syncopated to walking bass lines and Warren’s crisp drum breaks are clean and sharp. On the album’s title tune “A Boy’s Journey” Peter Hum is at his most lyrical. The gentle duet interplay between Cepelinski and Hum is perhaps at its most intuitive. Omae’s tenor is restrained and wistful, occasionally breaking into passionate cries. The piece probably best demonstrates Hum’s budding compositional flare. 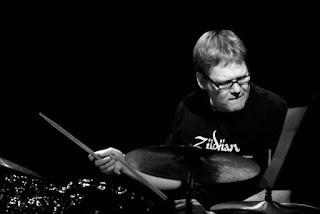 “Unagi” is driven by a repeating electric piano line, but is mostly a blowing session for Cepelinski’s on alto, Hum’s electric piano solo, Omae’s tenor and eventually a drum solo by Warren. “Three Wishes” starts off with a metronomic bass that sets the stage before it changes to more of a driving line. Hum sails away on piano as Warren and Walkington push the paces in double time. Cepelinski squeals as Warren bashes his skins into submission before. Omae enters the fray a little unconvincingly. 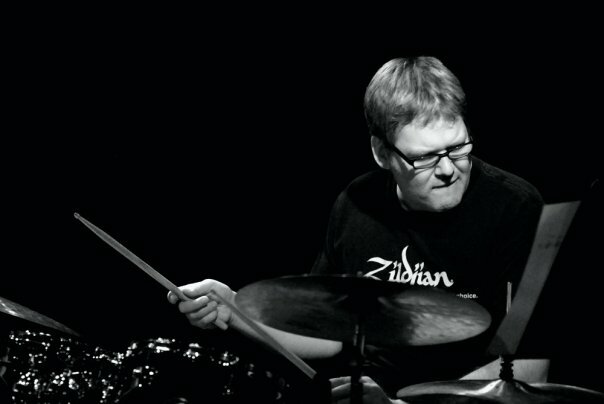 Warren plays a rolling tom solo, accented by shimmering cymbals. The composition wanders a bit before it settles back into its driving groove, eventually ending in a quiet coda. Peter Hum is an astute critic of the music. His debut album, “ A Boy’s Journey”, while at times uneven, demonstrates that he is on his way to being a creative compositional talent as well. Musicians: Peter Hum (piano & composer); Kenji Omae (tenor saxophone); Nathan Cepelinski (alto & soprano saxophones); Alec Walkington (bass), Ted Warren (drums). From the explosively pulsating opening number “Twenty-One” you get your first taste of the truly, tight and creative tour-de-force of a band that guitarist Jonathan Kreisberg has assembled for this fine date. The chicane like changes that he employs on this dynamic piece of music are impressively negotiated by Kreisberg’s lithe guitar lines and Will Vinson’s scalpel-like saxophone chops. Mark Ferber shows he is no stranger to odd time signatures, as he and bassist Matt Penman put this machine into overdrive. 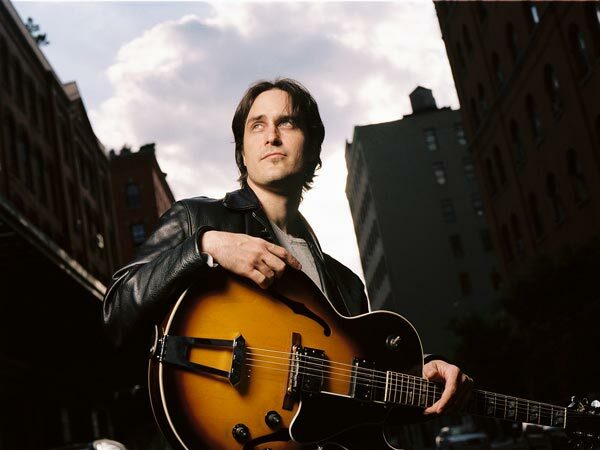 Kreisberg switches from his traditional guitar sound to a synthesized one, that while borrowed from the fusion era, has its own distinctively contemporary sound. On the title track "Shadowless” Kreisberg shows off his melodic side with a beautiful duet with pianist Henry Hey, whose keyboard intonation and attack is classical in its approach. 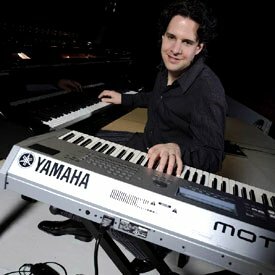 Kreisberg composes and plays with great emotional appeal, using his formidable technique to fill his music with unexpected surprises. Speaking of unexpected, Kreiberg’s take on the traditional Greek melody “Zembekiko” is the perfect marriage of traditional ethnic folk music with contemporary, straight ahead jazz. 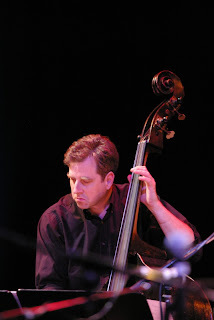 Matt Penman’s bass lines are particularly probing behind Kreisberg’s exploratory solo. Will Vinson’s swinging interplay with Henry Hey on the double timed break is particularly impressive. Kreisberg, for his part, makes his synthesized guitar sing like a Greek bouzouki player at a festive celebration. When Vinson chimes in with his slightly klezmer sounding saxophone lines, you can just see the celebrants eating the baklava and dancing with joyful abandon. Kreiberg is impressively adept at switching his guitar sounds seamlessly within a song to produce the desired effect. On the pensive “Long, Like A Mercury Day”, the sensitive interplay between Vinson’s soulful saxophone and Kreisberg’s volume controlled guitar lines is a delight. Ferber utilizes his brushes to perfection behind Kreisberg’s most traditional of guitar solos. “The Common Climb” features climbing guitar chords behind Ferber’s marching traps. Vinson and Kriesberg follow each other in a synchronous duet that eventually leads to a synthesized guitar solo with a sound that is my least favorite on the album. The song builds in intensity pushed along by Penman and Ferber as the strange guitar sound cries on. After reigning himself in from his experiments on the last tune, Kreisberg settles into the impressionistic little gem “Defying Gravity”. The shimmering cymbals of Ferber, the glissando lines of Hey, Vinson’s long, lingering saxophone voicing and Kreisberg’s decaying guitar sounds give the suspended listener a sense of floating on air. “Nice Work if You Can Get It”. Kreisberg alternates between Penman’s bass lines and then takes off in a double time romp with Penman and Ferber in a wonderfully communicative trio setting that allows both Penman and Ferber some solo time. It is the fine intuitive interplay that is most impressive on this song. Jonathan Kresiberg is a fusion-influenced guitarist who has an excellent melodic sense, formidable chops and easily extends the voice of his instrument with his creative use of electronics. Argentinean born Carlos Franzetti is a man of many talents. He is a superb pianist, as well as an accomplished composer and a brilliant conductor /arranger. He possesses the rare ability to bridge the divide between classical music, film scoring and contemporary jazz improvisation. Jon Faddis, soprano saxophonist Paquito d’Rivera, bassist Eddie Gomez and the pianist Steve Kuhn. My first experience with his artistry was his wonderful orchestral arrangements of Kuhn’s compositions on the pianist’s fine release “Promises Kept” from 2004. Prague Philharmonic Orchestra, Franzetti has created a wonderfully, lush and verdant compilation of delightfully diverse compositions that will simply enchant you for the entirety of its forty-two minute playing time. Each song represents an influence on the composer. The opening track titled “Mombasa” is homage to fellow countryman Gabriel Garcia Marquez and is a reference to the African city that was the background for the author’s novel “One Hundred Years of Solitude”. The music is appropriately cinematic in its feel. 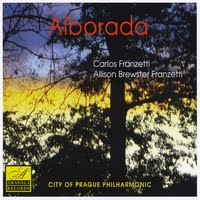 “Iluminata” is a dedication to his wife Allison Brewster Franzetti as well as a homage to the French composer Henri Dutilleux, The bellowing bassoons and dancing woodwinds create another impressionistic setting for enchanting piano improvisations by Ms. Franzetti, as the maestro brilliantly intersperses percussive accents with strings and bass to create a apparition of textures and colors. My personal favorite on the album is the inspired “Mirage” with its fusion-esque drive, its refined funk and its effective use of Fender Rhodes. Franzetti was obviously touched by the electronic foray of jazz into fusion and this is his current gesture towards that era, an era that he participated in his 1970 album "Grafitti"
“Pasacaglia” is perhaps the most classical, least “crossover’ of the nine compositions on the album. Ms. Franzetti is most at home on this processional inspired piece with her lithe piano solo work. “Iguazu” refers to Argentina’s treasured Iguazu Falls. Franzetti’s piano work undulates, one imagines, emulating the endless stream of water as it flows in continuous cascades from the upper parapets of this majestic falls. The ballad “ Song Without Words” is a showcase of Franzetti the jazz pianist, as he explores the jazz piano trio format with bassist Robert Balzaar and drummer Jiri Holzer. Franzetti's arrangement of the strings and orchestra is in counterpoint to the playing of the jazz trio, not simply an added embellishment. “Aborada” features the fine piano solo work of Allison Brewster Franzetti in a piece that is inspired by Ravel’s “Concerto in G”. Starting off as a neo-classical piece, Ms. Franzetti’s piano dances through this section in elegant precision, as the strings punctuate the changes. In the middle of the composition the pace turns into a jazz waltz, where Ms. Franzetti’s fluidity and improvisational adeptness seems to struggle a bit. “Serenata” is a Latin American inspired composition. It successfully bridges the fire of South American musical influences with the elements of western classical music. Ms. Franzetti ‘s playing here is stirring and impassioned. The finale is a dedication to the Brazilian singer/composer Milton Nascimento titled “For Ever Milton”. Mr. Franzetti sits back at the piano for this splendid uplifting homage. The maestro’s inspired piano solo work is complimented by his skillful use of strings and woodwinds to elicit a full range of emotions. What a joyful exclamation! 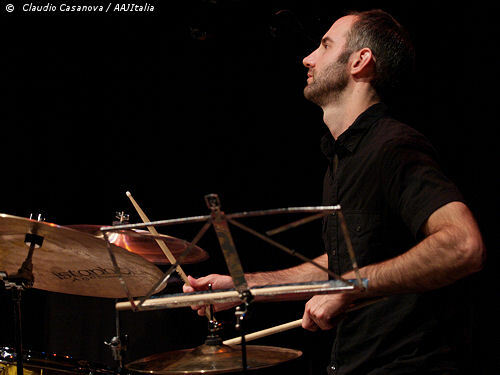 Musicians: Carlos Franzetti (piano, composer and conductor); Allison Brewster Franzetti (piano); Robert Balzar ( bass) ; Jiri Holzer (drums), the City of Prague Orchestra.